Saturday was my son's, and my birthday! We had a lot of fun with family, and friends! Even though I haven't planned on having a party, getting together at my house always turns into one! I am not much of a decorator, I got so much to learn in that department, but a slice itself is pretty enough. Make cream first, because cake part is easy , and cake layers cool pretty fast. Cake layer, chocolate cream, cake layer, vanilla cream, cake layer, chocolate cream, and some chocolate all around. 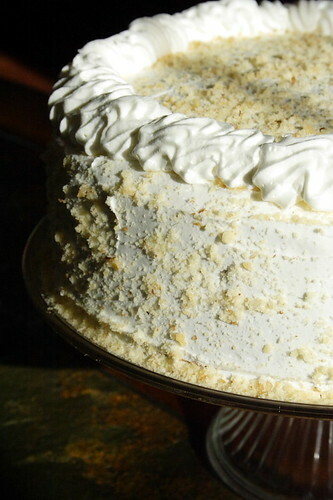 Then I used whipped cream all over and for decoration, and sprinkled with ground walnuts. Yummy! My son, waiting to grab his heart! One for mommy, one for him! This beautiful creation, called "King's Cake", was done by a friend! I guess I know now where to turn for decorating classes! :) Delicious! Thank you, Edita! Wishing you and your cute son a very Happy Birthday!The cake looks gorgeous,you don't need any decorating lessons. Happy Birthday to you and your son! The cake is beautiful! Prije svega SRETAN ROĐENDAN tebi i ovom malom slatkišu!!! Hope the two of you had a wonderful day! Great cake! 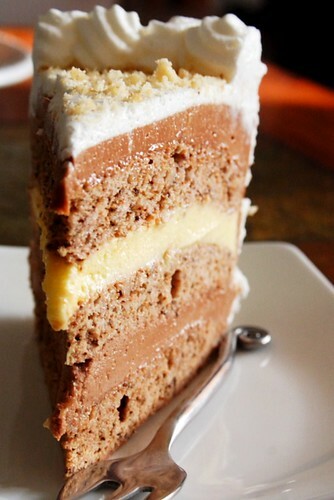 Your layers are perfect! Hope you had a great party! :) The cakes are wonderful, and Intercontinental is one of my favorites. Many kisses to your beautiful angels! Medena, happy Big Day to both your son and you! Wishing you all the best in life! Your cake looks gorgeous. 2 hours only? Fantastic job! HAPPY BITHDAY, FRIEND! Happy belated birthday! Wow! Just wow!! That cake is phenomenal! Dear Medena, Happy birthday to you and to your son!